Everybody knows what went down when Muhammad Ali fought George Forman to reclaim his title as the Heavyweight Champion of the World in Zaire's Rumble in the Jungle. However, because the fight was delayed over a month to give Forman time to heal a cut in the eye, what people are perhaps less aware of is the the three-day marathon music festival that was set to coincide with the event in an unparalleled show of “black power,” “black unity,” and “black music,” as promoter Don King and others described. Yet while Ali could dance in the ring and especially conversationally as this extremely rare footage from thirty-six years ago contains some fabulous Ali rants wherein he describes himself as the greatest fighter and most traveled black man in the world, when it comes to real dancing, we can't accept any substitutes to our one and only Godfather of Soul. And knowing that the audience would feel the exact same way, the filmmakers who painstakingly pieced together the entire festival experience cleverly teased us with James Brown's performance footage in a toe-tapping introduction before finally returning to him in the end. 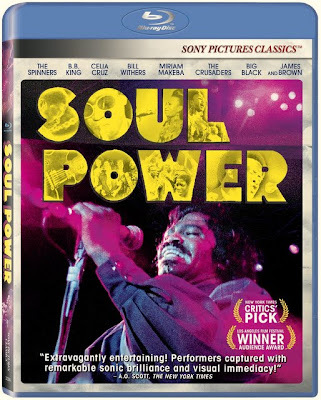 Still, in saving the best for last, similar to the overly long Woodstock, Soul Power suffers slightly in its decision of which footage to incorporate and which to abandon. Similarly, despite the fact that it uses a much more viewer friendly running time of roughly 90 minutes verses the Ken Burns-like length of Woodstock, the film nonetheless suffers a bit from its freewheeling approach as it's trying to fit in a variety of topics that could've all spun off into their own mini-documentaries. Wildly moving both stylistically and tonally throughout-- with the introduction of Brown at the beginning soon Soul goes against our initial impression of it as a concert film. For right after that, it switches gears completely as a work seemingly obsessed with the behind-the-scenes aspect of planning a festival and surviving the trials of staging a massive event in Africa. Yet while these two issues should've provided more than enough content, Soul Power also works in a sociological angle and then moves away from the music to fixate heavily on the incredibly fascinating Ali, morphing into what could be taken as a companion piece to When We Were Kings, especially given the clue of the the onscreen text alerting us when that film's director is in view. Although there are some wonderful performances by not only James Brown, who intriguingly seems fairly low-key and perhaps even shy when not onstage but also a moving tune by Bill Withers, favorites from B.B. King and others, the amount of music contained in the disc isn't as significant as one might have assumed considering the box and advertising campaign promise of giving you access to “the greatest music festival” you've never seen. While there are some deleted scenes included on Sony's top-notch Blu-ray that smooths out the dated footage and grain to the best of its ability, overall the highlight of the film as transferred to disc can be found in Sony's exceptional sound which even packs an Ali style punch on two basic LCD TV speakers, bouncing Celia Cruz, The Spinners and Miriam Makeba throughout the room. Similar to another talky music doc in Davis Guggenheim's superior It Might Get Loud, which was also released by Sony, the BD-Live portion of the disc offers you the chance to build your own playlist to e-mail or share, while also providing you with filmmaker commentary and/or the studio's movieIQ feature that provides additional information about whatever is occurring onscreen at any given moment. Definitely worth exploring for not only music and history lovers, it's also quite a find for those interested in the documentary process in evaluating both Soul's many pros as well as its cons. But overall, what could've been one soulful contender is hindered by the film's wandering focus as it feels like the cinematic equivalent of a two year Associate in Arts degree as we race from music to social sciences to sports, receiving too little information about too many things.